Looks like Maurice Sendak reads Dylan Thomas since he has no plans to go gentle into that good night. At 83, Sendak, who heralded a new age in children's books with Where the Wild Things Are, is about to publish the first book he's written and illustrated since 1981. 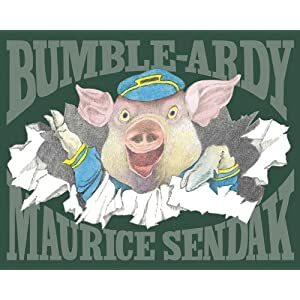 His hotly anticipated new picture book, Bumble-Ardy, features a mischievous year-old pig who hasn't had the pleasure of a birthday party in all his nine-years. The pig puts matters to right by inviting all his friends to a masquerade party that gets out of hand. It isn't due out until September with HarperCollins, but I can't wait to see it. It's reported to contain the same childhood exuberance and unshakable love between parent and child that won him both Caldecott and Hans Christian Anderson Medals.